KOEL Chhota Chilli Portable Petrol Generators come from the house of Kirloskar, India’s #1 Generator brand. Specialized in manufacturing of generators for more than seven decades. This all new Petrol Generator is the latest addition to this widest portfolio. With KOEL Chota Chilli enjoy the beneﬁts of mobility and portability. KOEL Chhota Chilli rolls on wheels and is equipped with a full-width handle. Now you carry power with you for a beach party or a jungle camp. This feature is of great help for small establishments and mobile workshops too! 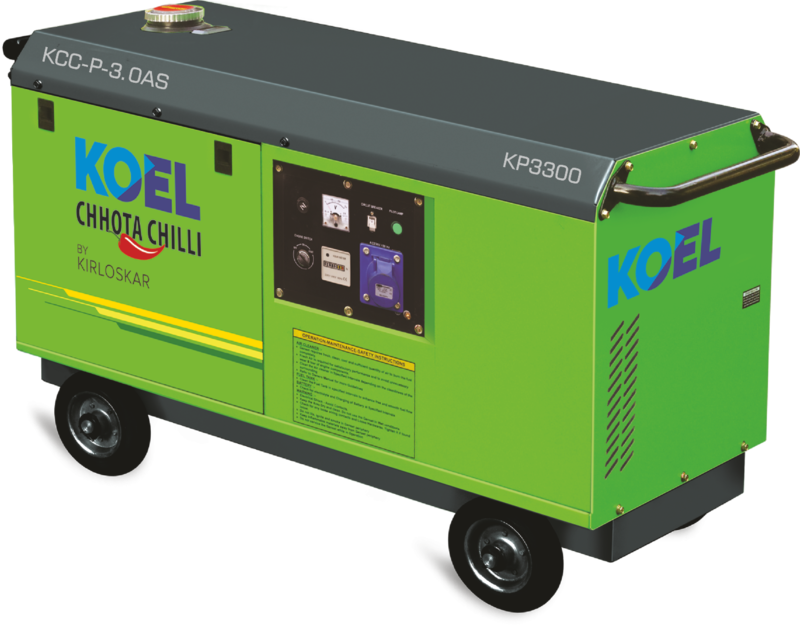 KOEL Chhota Chilli Generators reach you through the widest network of authorized dealers and are supported by over 5000 skilled service engineers spread across India. Quality of service and response is centrally monitored by KOEL. Dial the toll-free number and our authorized representative will be promptly available at your door step! Portable Petrol generator range that fulfills all your requirement. When it comes to Power, no one knows Generators better than us.